Freshwater fish habitats include freshwater lakes, swamps and Wetland habitats, billabongs and floodplains as well as streams and rivers. NSW rivers can generally be divided into short, high-gradient coastal streams, and long, low-gradient inland rivers. The flow of rivers is often unpredictable. Streams and creeks may flow for a large part of the year or only after heavy rainfall and floods. Broad habitat zones can be identified throughout a length of river or stream, such as pools, gravel beds (or "riffles"), snags, wetlands and riparian (riverbank) vegetation, as well as microhabitats within these zones. These environments provide important feeding, spawning and nursery sites for many native fish. Historically, the freshwater river systems of inland NSW were renowned for their fish. The early European explorers were often reliant on the abundance of fish. They also noted the large size of some they were catching. Their journals also document the Aboriginal’s willingness to offer fish as trade and their extensive use of fish traps. From the Journal of John Oxley (1820): 6th May 1817, Lachlan River. If however the country is poor, the river is rich in the most excellent fish, procurable in the utmost abundance. One man in less than an hour caught 18 large fish, one of which was a curiosity from is immense size, and the beauty of its colours. … [It] weighed more than seventy pounds … [and the length from nose to tail was 3 feet and 5 inches]. … Most other fish taken this evening weighed from fifteen to thirty pounds each … . … the water being beautifully transparent, the bottom was visible at great depths, showing large fishes in shoals, floating like birds in mid-air. I have seen the River cod (sic) very plentiful in the Yass, Tumut and Murrumbidgee rivers … … [T]heir average length is nineteen inches … and they are often captured from two and a half to three feet in length and weighing from twenty to twenty five pounds. … [T]hey have even been reported as attaining the weight of upwards of 120 pounds. … we were lure fishing behind a boat and the river had stopped running around here, and you could actually see the fish behind, like thirty metres behind the boat, come up and follow you down the river then go back to their log. … You could see down about ten or twelve foot. Yeah, it was actually crystal clear. 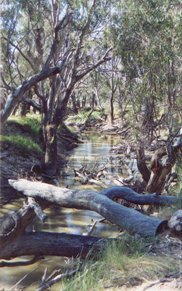 An account of what the Gwydir River was like within living memory can be found in An Oral History of the Gwydir River. Freshwater wetlands are an important habitat for fish, invertebrates, plants, and birds. They provide feeding, spawning and/or nursery areas for many species of freshwater fish. The wetlands support a diversity of plant communities including trees, rushes, reeds, or floating and submerged aquatic plants. They also function as natural flood mitigation devices by acting as sponges. They absorb and recycle nutrients, and act as filters for improving water quality. There are several types of freshwater wetlands in NSW, including permanent, temporary and engineered wetlands. Examples of permanent wetlands include some billabongs (e.g. Murray River) and shallow inland lakes (eg. Lake Cowal). 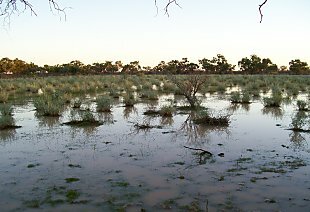 Temporary wetlands include most billabongs, seasonal freshwater swamps (e.g. Belmore swamp), ephemeral creeks, and artificial water storages (e.g. Menindee Lakes), farm dams and irrigation channels. Freshwater wetlands are found in both coastal and inland areas. 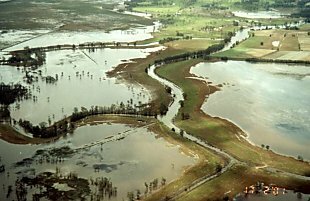 A floodplain is a creek or river flat subjected to periodic inundation by the overland flow of floodwaters. 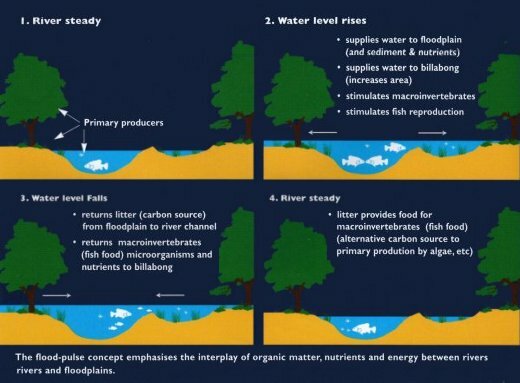 Why are floodplains important to fish? When inundated, river floodplains are important habitats for fish. On the western plains of NSW, they are extensive and can remain inundated for many months. Floods may occur annually or infrequently, such as one in 10 years, but, over the past 30-50 years, the frequency, extent and duration of flooding have been reduced by river regulation and water extraction. provide spawning sites for native species such as silver perch, golden perch, bony herring and spangled perch. 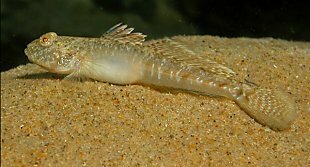 Once hatched, the fish develop rapidly and feed on small zooplankton and insect larvae. In many rivers, deep pools provide important fish habitat and refuge areas. As the flow in the river decreases, fish retreat to these pools to wait for the return of higher flows. Even after prolonged droughts, fish will rapidly recolonise a river provided these refuge areas are available. Other channel habitats such as undercut banks, rock ledges, boulders, snags, weed beds, and backwaters all offer essential habitat sites for fish. The biodiversity of streams is also dependent on having a variety of substrates. 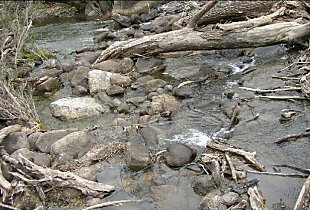 The bed of the river may be comprised of bedrock, gravel, snags, sand or mud.These often provide breeding sites for different fish species. Gravel habitats are generally much more productive than equivalent areas of sand or mud. The spaces between the stones are inhabited by invertebrates, and provide small fish with refuge from predators and strong currents. Gravels also provide a surface for algae to grow, which, in turn, is eaten by many invertebrates and some fish. Gravel beds are used as spawning habitat for a variety of freshwater fish, including Macquarie perch and freshwater catfish. In-stream vegetation may include trees, sedges and rushes, submerged macrophytes and algae. Some trees such as Melaleuca and Casuarina species can grow within channels and provide fish habitat by creating bars, islands and pools along the bed of the stream. The tree roots stabilise sediments and the exposed vegetation increases channel roughness. This slows water flow, creating backwaters and eddies where fish can rest. Some sedges such as Baumea species and Lomandra longifolia grow directly along the lower part of banks and provide excellent bank protection and capture nutrients. Macrophytes (including submerged and semi-submerged species) act as a nutrient sink and source, stabilise sediments, and provide habitat for fish and other aquatic organisms. Freshwater and brackish species provide small fish with feeding opportunities and shelter. 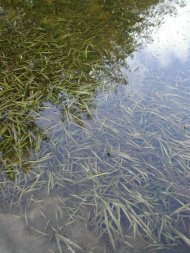 Typical submerged plants in rivers include Vallisneria gigantea (ribbonweed) and Potamogeton species (pondweeds). Free floating plant species are not commonly found in flowing streams. Common native species in NSW include Phragmites australis (common reed), Typha species (cumbungi) Bolboschoenus fluviatilis (marsh clubrush), Schoenplectus mucronatus, S. validus (river clubrush), Triglochin procerum (water ribbons) and Persicaria species.4 Some species, such as P. australis and B. fluviatilis, often form a link between estuarine habitats such as seagrasses and freshwater habitats such as ribbonweed. These beds of ribbon weed may function as migration corridors for fish species that migrate between saltwater and freshwater throughout their lifecycle, and are therefore critical to the recruitment success of some fish species such as Australian bass. Large woody debris, or 'snags', refers to the large woody debris from trees and shrubs, including whole fallen trees, broken branches and exposed roots that have fallen or washed into a waterway and are now wholly or partially submerged by water. Snags also include submerged large rocks (of greater than 50cm in two dimensions). increasing the diversity of physical habitat types within the stream. Snags contribute to fish habitat by deflecting currents and creating eddies. This creates relatively still areas and zones of increased flow. This variability provides resting places for fish away from strong currents. It also creates localised variations in substrate by promoting fine silts to settle in still areas, while all but the larger gravels may be scoured out where currents are strongest. Many native fish will almost always be found in or near snags in rivers, such as trout cod, Murray cod, the two spined blackfish, eastern freshwater cod and golden perch. Some smaller fish species use snags for refuge and shelter from predation, and are often found shoaling around rocks, fallen trees and branches (e.g. olive perchlet, Australian smelt, Duboulay’s rainbowfish, and estuary perchlet). Table 1 indicates how some native fish use snags at different stages of their life cycle. At present, there is no set of principles for the assessment of fish habitats in the large dryland rivers of the Murray-Darling Basin, despite the fact that they account for 83% of all lowland rivers in Australia. 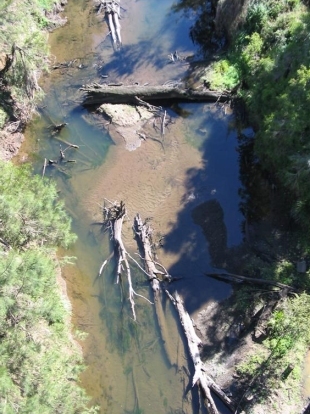 This study developed a framework that could be used to assess fish habitat in such rivers and then applied the framework to determine habitat associations in the Barwon-Darling and Paroo Rivers and to report on the condition of those habitats and the fish assemblages in them. 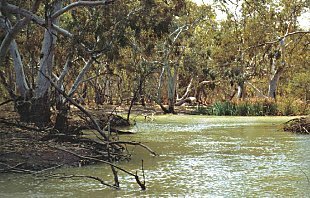 The Paroo River is a largely unmodified river with less wet channel than the Barwon-Darling. As the amount of wet channel increases downstream in the Paroo River, the habitat of this river changes to more closely resemble that of the lower Barwon-Darling. The Paroo River has low gradient smooth banks and numerous mid-channel bars, whereas the Barwon-Darling River has benches and vegetated point bars along its generally steep, incised banks. The riparian zone in the upper reaches of the Paroo River has medium density trees which are sometimes clumped and overhang the channel but the lower reaches have only scrubby riparian vegetation. The upper Barwon-Darling is characterised by tall riparian trees of medium density while the lower reaches vary between sparsely vegetated sections and sections forested with tall trees. 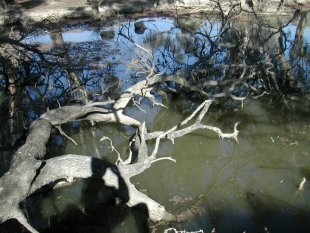 Structural woody habitat within the Paroo River includes medium to small items of varying complexity but the Barwon-Darling generally has much larger structures along with abundant small branches. Within both rivers there was a consistent downstream reduction in structural woody habitat and smooth bank, and a downstream increase in water depth and the amount of matted bank. Although strong associations were consistently found between the number of fish and the amount of structural woody habitat, the availability of this habitat type was not a good predictor of differences in fish assemblages along the length of the Barwon-Darling River. It is likely that a combination of habitat types and the unobstructed passage of fish along the river corridor may be important in structuring the fish assemblage at the river scale. Therefore, decisions regarding the reintroduction of suitable fish habitat (e.g. snags) cannot be made in isolation from processes that affect the fish assemblage at larger scales such as barriers to fish migration, river regulation and landforms. Plants growing along the banks of rivers and creeks are known as riparian vegetation. This vegetation stabilises riverbanks, stops erosion and subsequent siltation and contributes food, such as organic matter and falling insects, to the stream. It also partially filters out pollutants, such as sediments, pesticides and fertilisers, being carried towards the waterway, acting as a buffer strip. The roots of trees bind and stabilise the soil of riverbanks, minimise siltation, provide shelter and help to retain the general channel shape, including such important habitat features as pools, riffles and backwaters. Streams with well-developed riparian vegetation also have a greater diversity of instream habitat for fish than those with no trees along their banks. Material and insects falling from trees also provide food for crustaceans and aquatic insects, which in turn provide food for fish. In freshwater habitats, more than half of the diet of fish may come from insects falling into the stream from the riparian vegetation. Overhanging trees provide shade, which lowers water temperature (often important for fish survival) and can, by a dappling effect, camouflage fish from predators. Native trees are preferable as riparian vegetation to alien plant species such as willows, which tend to spread and choke waterways causing their banks to erode. The deciduous leaf fall of alien species is added to the water over a relative short time where the harder leaves of eucalypts, casuarinas and other native trees are gradually shed into the water where they are consumed by stream organisms. Weed species with dense canopies also prevent native shrubs, reeds and grasses from growing. An inland river with intact riparian vegetation. NLWRA (2001) Australian Water Resources Assessment 2000: Surface Water and Groundwater – Availability and Quality, National Land and Water Resources Audit, Canberra. Scott, A. (2005) Historical evidence of native fish in the Murray-Darling Basin at the time of European settlement – from the diaries of the first explorers. CRC for Freshwater Ecology. Mussared, D. (1997) Living on Floodplains. CRC for Freshwater Ecology and the Murray Darling Basin Commission. Sainty, G.R. and Jacobs, S.W.L. (1994) Waterplants in Australia, 3rd Edition, Sainty and Associates, Darlinghurst, Sydney. Koehn, J. and Nicol, S. (1998) Habitat and movement requirements of fish, In Eds. R.J. Banens and R. Lehane, Proceedings of the 1998 Riverine Environmental Forum, pp. 1-6. October 1998, Brisbane, Queensland. Murray-Darling Basin Commission. Sinclair Knight Merz (2003) Guidelines and Protocols for the Management of Native Fish Habitat, Murray Darling Basin Commission Project R2120. Boys, C.A., Esslemont, G.and Thoms, M.C., (2005) Fish habitat and protection in the Barwon-Darling and Paroo Rivers. Final report to the Department of Agriculture, Fisheries and Forestry – Australia (AFFA). NSW Department of Primary Industries – Fisheries Final Report Series No. 78. 118pp. ISSN 1449-9967. Growns, I., Gehrke, P.C., Astles, K.L. and Pollard, D.A., 2003. A comparison of fish assemblages associated with different riparian vegetation types in the Hawkesbury-Nepean River system. Fisheries Management and Ecology 10(4): 209-220.